BEIJING -- A state-owned Chinese automaker announced plans Wednesday to produce electric vehicles in South Africa, highlighting the growing role of the world's largest auto market in a technology seen as the global industry's future. 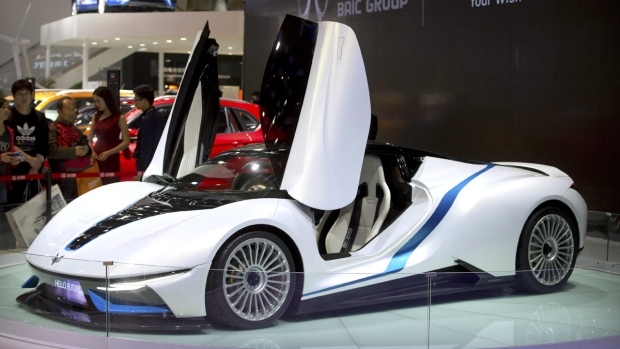 BAIC Group's announcement at the Beijing auto show, the industry's biggest sales event of the year, came as Nissan unveiled its first electric car designed for China while General Motors displayed Buick SUV it says can go 600 kilometres on one charge. Chinese automaker Geely debuted a gasoline-electric hybrid developed with its Swedish sister company, Volvo Cars. Electrics are money-losers for most producers, but automakers are investing heavily in what they see as the wave of the future, especially in China. Its communist leaders want to make their country a centre for the emerging industry and are promoting electrics with subsidies and other tools. China accounted for half of last year's global sales of electrics. Auto executives say Chinese sales of electrics and hybrids could top 1 million vehicles this year. BAIC is preparing to set up a "new energy car production base" in South Africa by the end of June, said chairman Xu Heyi. Xu said it would have an annual production capacity of 100,000 vehicles but he gave no details of how much of the manufacturing would be done in South Africa. That would make BAIC the second Chinese company to produce electric vehicles abroad, following BYD Auto, which manufactures battery-powered buses in a California factory. "BAIC is going to become a leading domestic and world-class new energy car-manufacturing company," Xu said. BAIC makes a popular low-priced line of plug-in electrics. It plans to increase total annual sales of electrified models to 1.5 million by 2025, Xu told reporters. The government is shifting the financial burden for developing e-vehicles to automakers with quotas that take effect next year. They require them to earn credits by selling electrics or buy them from competitors. That is forcing brands to create models that can appeal to Chinese buyers without subsidies. At the auto show's media day, Nissan Motor Co. unveiled its Sylphy Zero Emission, the first of 20 electric models the Japanese automaker and its local partner plan to roll out in China over the next five years. Nissan says the Sylphy, a lower-priced version of its popular Leaf, can go 338 kilometres (210 miles) on a charge. "The new EV era for Nissan begins today," said Jose Munoz, chairman of Nissan's management committee for China. Munoz said the car is part of efforts to make China a "profit pillar" for Nissan along with Japan and North America. The Beijing show, Auto China 2018, is being overshadowed by mounting trade tensions between Beijing and U.S. President Donald Trump, who has threatened to hike tariffs on Chinese goods including automobiles in a dispute over technology policy. The impact on automakers should be small, according to industry analysts, because exports amount to only a few thousand vehicles a year. Those include a GM SUV, the Envision, and Volvo Cars sedans made in China for export to the United States. China's first-quarter sales of electrics and gasoline-electric hybrids rose 154 per cent over a year earlier to 143,000 units, according to the China Association of Automobile Manufacturers. That compares with sales of just under 200,000 for all of last year in the United States, the No. 2 market. GM, Ford Motor Co., Daimler AG's Mercedes unit and other automakers are developing models for China with local partners that deliver more range at lower prices. On Tuesday, Volkswagen unveiled the E20X, an SUV that is the first model for SOL, an electric brand launched by the German automaker with a Chinese partner. The E20X, promising a 300-kilometre (185-mile) range on one charge, is aimed at lower Chinese market tiers where demand is strongest. "The Chinese market is key for the international auto industry and it is key to our success," said VW CEO Herbert Diess. The auto show follows Beijing's announcement last month that it would allow full foreign ownership in its auto industry beginning with electrics producers this year and extending to all vehicle types by 2020. That would repeal rules that required global automakers to work through local partners, an arrangement that required them to share technology with potential Chinese competitors and prompted complaints by Washington, Europe and Japan. 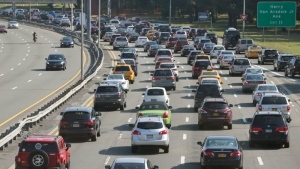 Auto companies have complained joint ventures are costly and cumbersome, but executives said they are unlikely to make any changes immediately. They said automakers are likely to stick with local partners that help with government relations and sales in China's state-dominated economy. "Relationships and working together is more important in China than any place I've ever worked," said Trevor Worthington, Ford Motor Co.'s vice-president for Asia-Pacific product development. "I couldn't imagine a world in which we said we are going to go it on our own." Electrics are forecast to account for 35 to over 50 per cent of automakers' China sales by 2025. At the show, global and Chinese brands also displayed dozens of gasoline-powered models from compact sedans to luxurious SUVs. Their popularity is paying for development of electrics, which aren't expected to become profitable for most producers until sometime in the next decade. China's total sales of SUVs, sedans and minivans reached 24.7 million units last year, compared with 17.2 million for the United States. SUVs are the industry's cash cow. First-quarter sales rose 11.3 per cent over a year earlier to 2.6 million, or almost 45 per cent of total auto sales, according to the China Association of Automobile Manufacturers. New but fast-growing Chinese automakers trail global rivals in traditional gasoline technology but industry analysts say the top Chinese brands are catching up in electrics, a market with no entrenched leaders. BYD Auto, the biggest global electric brand by number sold, presented two hybrid SUVs and an electric concept car at the show. The company, which exports battery-powered taxis to Europe, also displayed nine other hybrid and plug-in electric models. Geely unveiled a gasoline-electric hybrid sedan, the Bo Rui GE, developed with Volvo Cars, also owned by Geely's parent company. Jianghuai Automobile Co., the local partner in VW's Chinese electric brand, also is looking at possible plans to export electric cars to Europe and Latin America, according to Xia Shunli, general manager of JAC's electrics unit. The Geely parent became Daimler's biggest shareholder this year with the purchase of a 9.7 per cent stake. Industry analysts say that gives Geely founder Li Shufu leverage to press for possible collaboration, though the German automaker already has a venture with Chinese rival BAIC Group. Daimler had a preliminary meeting with Geely but has yet to discuss alliances or any other details, said its chairman, Dieter Zetsche. He said the meeting was no more than "get to know each other." "We have not even found specific topics to talk about," Zetsche told reporters. "We are in very early stages."